Highly suitable for large through puts, high porosity materials, minerals, dye-stuff etc. Overcomes all disadvantages of all other vacuum filters put together. Filtration takes place on an endless variable porosity filter cloth. A thick rubber belt supports the endless filter cloth from below. 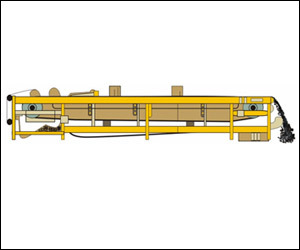 Slurry feed, gravity filtration, vacuum fiitration, multiple cake washing, dewatering, cake discharge, cloth cleaning, alignment take place continuously and un-interruptedly. Works in consonance with natural filtration parameters. Gives extremely conststant operational parameters. Highly suitable for solids with high porosity and filter a bilit. Fertilisers, minerals, various chemical industries, dye-stuff and many others. An endless rubber belt with traversing grooves drains the filtrate towards holes positioned along the belt. 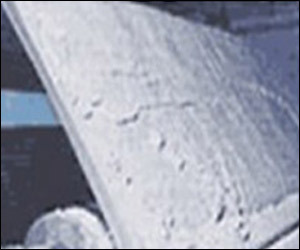 Synthetic plies encapsulated in the rubber part below the grooves serve to withstand the longitudinal stresses to which the belt is subjected. It retains the cake and moves together with the belt. Various MOC, porosity, weaving type ere. are available. A vacuum box below the belt is mounted along the filter and collects the filtrate. through a manifold to the receivers. 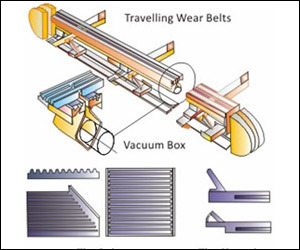 The box at its tops-de has two lips covered with low friction synthetic strip liners that seal through intermediate wear belts between the bottom side ofthe belt and the surface of the strips. Since the belt Is the most expensive part of the filter these endless narrow belts serve as sacrificial component that takes the wear between the surfaces, protects the rubber belt and secures against vacuum leaks. 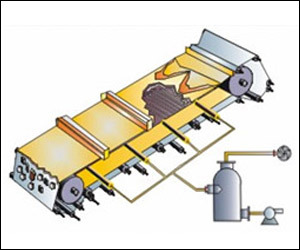 Once the belt reaches the end of the vacuum box the cake drying portion of the cycle terminates and the cloth leaves the rubber belt. The cloth continues moving. changes direction over the discharge roll and the cake drops through a chute for further handling. 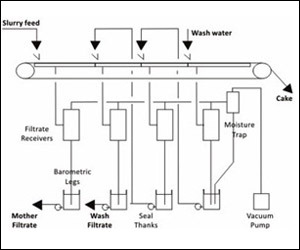 A filtrate manifold collects the mother and wash liquids to one or more vacuum receivers.